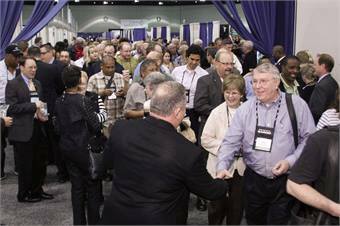 Continuing its affiliation with the National Tour Association (NTA), the United Motorcoach Association’s (UMA) Expo at Travel Exchange featured plenty of new motorcoaches, while stressing partnerships and professional growth. The intent of the co-located show, held this year in Los Angeles, continues to be to provide operators with a more comprehensive understanding of the entire group tour and travel industry, while encouraging the forming of new business relationships. 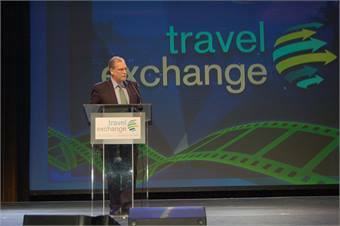 CBS News Travel Editor Peter Greenberg touted the thriving tour and travel industry, while urging the crowd to remain competitive on overall value instead of simply offering low rates, so the trend can continue. During the Opening Ceremony, CBS News Travel Editor Peter Greenberg touted the thriving tour and travel industry, while urging the crowd to remain competitive on overall value instead of simply offering low rates, so the trend can continue. Greenberg also discussed how motorcoaches have become one of the fastest growing modes of transportation in the travel and tour industry, calling their usage one of the most economically viable alternatives around for trips under 400 miles. To that end, Greenberg implored the crowd to urge Congress to both pass a surface transportation bill and continue to invest in rebuilding and repairing the nation’s infrastructure. At the Legislative & Regulatory Update, Becky Weber of Prime Policy Group and lobbyist for the UMA, discussed the upcoming Capitol Hill Day in June, where UMA members can take part in face-to-face meetings with their congressional representatives to discuss issues impacting the industry. Hoping to build on that success, Weber discussed the importance of passing a surface transportation bill before the Highway Trust Fund runs out of money, which is expected to happen this fall, as well as making sure the industry’s voice is heard on Capitol Hill regarding issues of impact, including preventing transit agencies from competing with motorcoach companies, eliminating a 7.6% fuel tax that motorcoach operators pay, and the need for a reasonable and rational approach when developing and implementing new regulations. Meanwhile, UMA’s VP, industry relations, Ken Presley told the crowd there are currently 41 new regulations facing the industry, including possible rules being released on roof crush strength, anti-ejection window glazing, tire pressure monitoring, rollover prevention and more. Additionally, Presley discussed the final seat belt ruling recently handed down, which makes them mandatory on all motorcoaches by November 2016, but does not require retrofitting. He also discussed recently released notices of proposed rulemakings that will impact the industry, including the establishment of a drug and alcohol clearinghouse, the use of electronic logs and the development of interchange of equipment protocols. During the “Buying Media” marketing session, Spader Business Management’s Jim McCann said it is imperative to establish marketing and media objectives before choosing an advertising platform that works best for your business. Once these items are addressed, McCann added it is important the quality of your ad includes the Four I’s: Impact, Immediacy, Image and Ingenuity. As for platforms, McCann said it is best to select the medium that best suits your goals and fits within your budget limitations. Some in the crowd discussed their own advertising successes, including finding television to be “cheaper than you think” and partnering with other stakeholders that share the same goals or want to send a similar message. To capitalize on that advertising campaign, the “Converting Price Shoppers to Value Buyers” session gave a quick review of the charter sales process from the greeting to asking for and closing the sale, before moving on to an exercise that could help operators boost business. The exercise, moderated by Peter Shelbo of Tour West America and Gladys Gillis of Starline Luxury Coaches, asked the crowd to first come up with a feature of their company, and then, identify the benefit of that feature and how it equates to having value for the customer. “If you do this exercise at your operation and you are able to just close one extra sale per day, your business will go up 10%, which is substantial for any business,” explained Gillis. Other session topics covered over three days included public/private partnerships, safety management, website optimization and managing fuel costs. ABC and New Flyer officials Jon Savitz, Roman Cornell and Paul Smith (left to right) signed an exclusive distribution agreement at the event. Officials from ABC Companies and New Flyer were on hand to sign an agreement on the show floor, making ABC the exclusive distributor of New Flyer’s MiDi and Xcelsior transit bus models to U.S. private bus and shuttle operators. Under the terms of the agreement, ABC will market, sell and provide aftersales service for New Flyer’s MiDi mid-sized and Xcelsior heavy-duty buses through its established service locations and select independent dealerships. All New Flyer products purchased through ABC’s Specialty Vehicle Division, headed by Roman Cornell, will be fully supported by New Flyer’s industry-leading warranty, genuine spare parts and lifetime customer care programs. “This is a great opportunity for New Flyer to respond to private customer demand and expand our market reach in the United States,” said Paul Smith, New Flyer executive VP, sales and marketing. ABC also showcased its new CX and TX models, which feature more standard features, including daytime running lights, back-up cameras, three-point seat belts, and tire pressure monitoring and fire suppression systems. 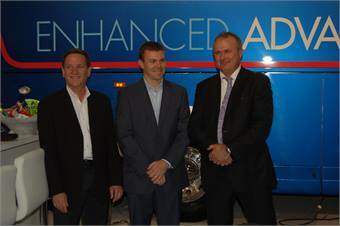 In addition, ABC recently signed a manufacturing agreement with Alexander Dennis Ltd. Inc. to assemble the Enviro500 and the 40-, 45- and 60-foot Enviro400, low-floor, double-decker buses and also featured Ameritrans’ Executive Shuttle on the show floor. During a media session, Motor Coach Industries’ (MCI) Executive VP, sales and marketing, Patrick Scully discussed the motorcoach industry’s growth in sales — 22% from 2011 to 2012 — and the company’s success with its J4500 and Setra products as well as in the line-haul segment with big market customers, including Greyhound, Peter Pan and Coach USA. Also on hand was Brent Maitland, MCI’s VP, marketing and product planning, to discuss recent changes to its J4500 model — including the MCI Dynamic Suspension System, newly designed parcel racks and cleaner-burning 2013 EPA-compliant engines — as well as the Setra S 417 — optional second door and club corner lounge seating. Temsa and CH Bus Sales featured their new TS 45 model and honored the first customer set to take delivery, Caseyville, Ill.-based Vandalia Bus Lines Inc. The 45-foot coach seats 57 passengers and is constructed from stainless steel with an integral monocoque design, ensuring strength and stability. Like Temsa’s smaller models, the TS 45 couples a Cummins engine with an Allison transmission. Standard features include an engine fire suppression system, lane departure warning system, tire pressure monitor system, ABS brakes and three-point seat belts. Full production of the TS 45 is set to begin by mid-2014. Presented by Prevost, the UMA and the College of Southern Maryland, Prevost Prep is designed specifically for drivers to meet the driver training needs of the motorcoach industry. “Drivers are one of the industry’s cornerstone resources and we must do what we can to encourage skilled drivers to enter the industry. Training is an important part of that attraction and retention,” said Gaetan Bolduc, Prevost’s CEO. Prevost also announced it partnered with Hire Heroes USA to assist motorcoach operators in recruiting qualified drivers and maintenance personnel. METRO Magazine’s Motorcoach Operator of the Year Award went to Larry and Lorna Hundt of Kitchener, Ontario, Canada’s Great Canadian Holidays Inc. The UMA Safety Leader Award went to Godfrey LeBron of Paradise Travel in Franklin Square, N.Y., with Lewiston, Maine’s NorthEast Trailways winning the Green Highway Award. This year’s UMA Vision Award winner, small operator, was American Heritage Trails of Fort Wayne, Ind., with Minn.-based Northfield Lines Inc. winning the large operator category. This year’s Maintenance Competition Winner was Greg Lammers of Cavalier Coaches Inc. in Owatonna, Minn.
Next year’s Travel Exchange will be held in New Orleans Jan. 18 to 22.